Chimpanzee Tea Party: Best Bottle for the Aspiring Wine Lover? It seems both an obvious choice and an absurd one. Beaujolais’s historic reputation as a juicy, joyous wine was at odds in the last quarter of the 20th century with its descent into a banal beverage more noteworthy for the marketing success of Beaujolais nouveau than for pleasure in the glass. But in the last 15 years, Beaujolais has come back strong. Numerous small producers, focused squarely on quality, have seized the initiative in the region, setting a template for success in Beaujolais. 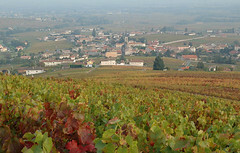 In the process, they have not only revived the reputation of Beaujolais for exuberant, spirited wines, but have also won the region new respect for complexity and even age-worthiness. This is especially true of wines from the 10 crus, the highest echelon of Beaujolais terroir, which include the five best-known: Brouilly, Fleurie, Juliénas, Morgon and Moulin-à-Vent. Click through for an interesting read and a review of ten 2009 bottles all around the $20 price point.